Most of the time I give tips on how to improve your visual storytelling. Today I am going to point out 7 problems that I often come across with a video project. Problems often occur because a brand does not apply their usual marketing process to their video production. 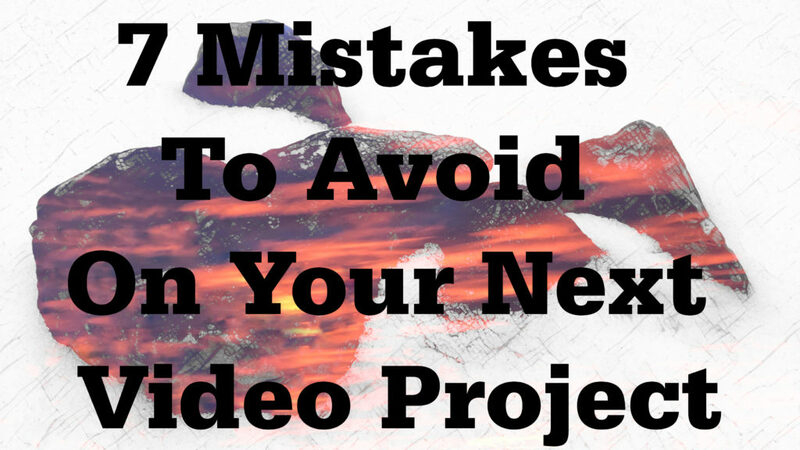 Video projects can be expensive in both terms of time and limited resources. One of the easiest ways to make a video project overrun a budget is to fail to make a plan at the start. The best place to start any video project is with a coherent plan that defines the video’s goals and how you are going to achieve those goals. The plan should detail every element of the project from concept to what metrics will be used to measure the success of the project. Another common mistake when creating a video is not having a logical structure. At the very least a video should have a beginning, a middle and an end. These should all support the common purpose of the video and should support the videos “call to action”. It is very easy to create a video without putting yourself in your audience’s shoes. If you do not understand your audience and do not do some research on your audience at the start, you are leaving the success of your video to chance. Leaving things to chance is not the basis for success, so you need to do comprehensive research on your potential audience before planning your video. The result of this research will help you plan and execute a video that matters to your audience. A brand needs to think of itself as part of the entertainment business when it comes to creating a video. Your audience not only expects to be educated about your brand they want it to be done in an entertaining manner, that is less about the brand and more about the customer. They want themselves and their needs at the heart of your video proposition. Think about creating a video in the most creative manner you can think of. Audiences want information in new and innovative ways that make you stand out from your competitors. The best brand videos tell a story that an audience can relate to. A story is one of the most effective ways of sharing information a brand has. It paints a visual picture, allowing the audience to understand the importance of the point you are sharing. By not telling a story your message may not capture your audience’s attention. Time is a precious commodity in a fast moving world. If you show an audience you really value their time and only share with them the essential story they need to hear, they will reward you with their attention. We all have a tendency to over complicate our story. We add to much detail into our storytelling or get diverted from our main point. When planning a video project think about how to tell your story in a way that is easy for your audience to understand. Only use visual imagery that enhances your point and make sure you have the final edited video reviewed by a test audience to check for narrative confusion. We can all make mistakes, however with any marketing process, we can always do better. Every video project you do should be subjected to an intensive review process. This should include everything that went well and the things that didn’t. Only by having such a review process can you ensure that your video strategy is working. Posted in Video Content and tagged brand story, brand video, Successful Video, video, Video Project on October 30, 2018 by admin.